he question is, who's going to own the town when all is said and done? Well partner, if you haven't got lead in your feet and aren't afraid of taking a little lead in your body, this is your chance to stake your claim or leave the table!!! 1 Sheriff Badge card with a card stand. 1 Shuffle the General Store cards. Make a draw placed face down. 2 v Shuffle the Property Claims cards. Make a draw placed face down, and then draw and turn over the first 3 cards. 4 Place the 30 gold Nuggets on the Gold Mine. 5 Place 3 x $1 bills on the Bank. 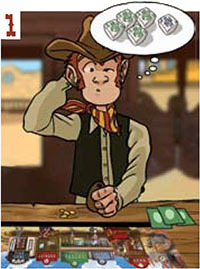 6 The youngest player receives the Sheriff's Badge card and put it on the card stand. Put together a Poker Hand using their 5 Poker dice. 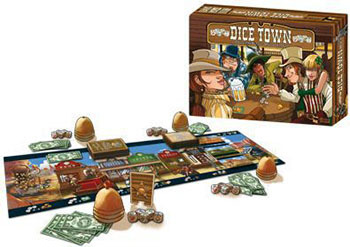 Then, depending on the nature of their hand, take control of various key places in Dice Town that will allow them to do corresponding actions. Simultaneously, the players each shake their 5 dice in their cup. The cups are fl ipped over towards the table keeping the dice hidden. 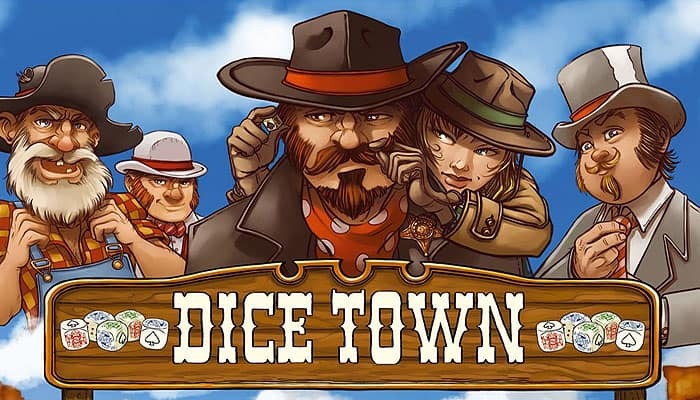 Then, the players each secretly look under their cup, keeping one (and only one) die under the cup, and taking the other dice into their hands. The players then lift up their cups simultaneously, revealing the die they kept for all to see. This process is continued, until each player has built in front of them a Poker hand of 5 dice. Players may want to keep more than one of their dice during a roll. 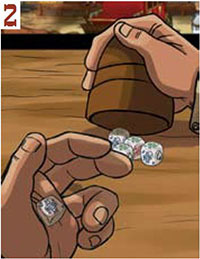 A player leaves all the kept dice under the cup, and picks up the remaining ones. Here, he has kept 4 dice under the cup and picks up the remaining die. 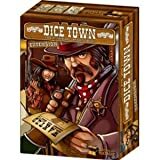 When the player lifts up the cup to reveal the kept dice, $1 per kept die is paid immediately for every die over the fi rst one! (in this case $3) Dollars Bills spent in this manner are placed on the Stagecoach. Note: it is also allowed, after a roll, to not keep any die under a player's cup... This action also costs$1, and it is placed on the Stagecoach. When this happens, the players who haven't finished up their Poker Hands, are entitled to one last roll with their remaining dice. They must keep the result, whether they like it or not. On the good side, they don't have to pay anything, even if they threw more than one die on this last roll. 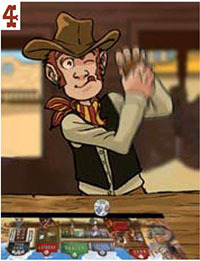 (Note: a same player may make more than one action during a same round. It is also possible, that a place is not attributed to anyone depending on the Poker Hands obtained. In case of a tie, the current Sheriff decides, see under 6). 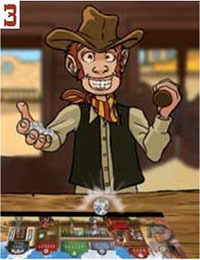 The player who obtained the highest number of 9's exploits the Gold Mine. He earns 1 Nugget for each 9 in his Poker Hand. Each nugget awards 1 VP (Victory Point) at the end of the game. The player who has the highest number of 10's robs the bank, making off with all of the bills present there. Every 2 bills award 1 VP at the end of the game. This place is attributed to no one. The Stagecoach arrives to restock the bank: the bills that are lying there are placed on the bank for the next round. The player who has the. highest number of J's goes to the General Store. 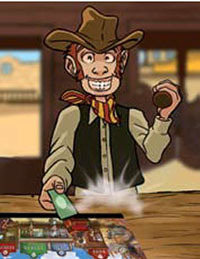 The player draws as many cards as J's in the player's Poker Hand, keeping one and discarding the others face down to a discard on the side of the board. (If there are not enough cards, reshuffle the discard pile and make a new draw). This card awards 4 VP to anyone holding it at the end of the game. This card doubles the Nuggets when the Gold Mine is won. Important: For the first round, the Drugstore winner exceptionally make the action twice (draw, select a card, discard, and then draw again, select a new card, and discard again). The player who has the highest. number of Q's wins the favor of the Girls, and takes advantage of their charms to steal from an opponent. Take as many , cards as Q's in your Poker Hand, keeping one and giving back the others. Stealing cards allows you to weaken an adversary while earning points! Try to keep track of which players have the strongest cards. The player who has the highest number of K's becomes the new Sheriff: the Badge card is taken and placed in front of that player. The Sheriff decides who wins for any ties. It's allowed to offer Nuggets, cards, and bills to the Sheriff to influence decisions. 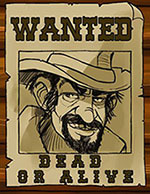 The player who is Sheriff at the end of the game is awarded 5 VP. 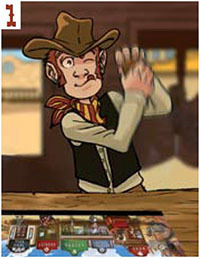 The player who has the best Poker Hand gives the town and the Mayor a good reputation, advancing his political career. The happy mayor returns the favor in the form of new Property Claims. 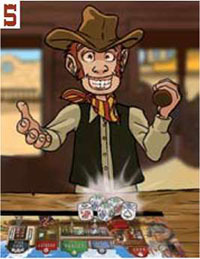 The player is automatically awarded the first Property Claim lying face up in the line (the bottom most one), plus a supplementary Claim (the one just above it) for each Ace in his Poker Hand (limited to 3 maximum, all the cards visible). Any remaining cards are slid towards the bottom, and the line is restocked with the top cards of the draw. The Property Claims award from 1 to 5 VP. If a player didn't win anything during a round, he can go and visit Doc Badluck. In the event that several players were feeling sickly, the Sheriff decides in which order they'll make their visits. 9 or 10 allows the players to equip themselves with barbed wire. Choose two Property Claims from your hand and place them face up in front of you. They can no longer be stolen by your opponents. J or Q allows you to draw the first card from the General Store pile. K allows you to set up a little sting operation. All the other players must give you $2 each. Ace allows you to set up a big sting operation. All the other players must give you a Nugget each. There are no more Gold Nuggets in the Gold Mine. All of the Property Claims have found owners. The Property Claims award the number of VP indicated. The player with the highest total is declared the winner.